Mr. 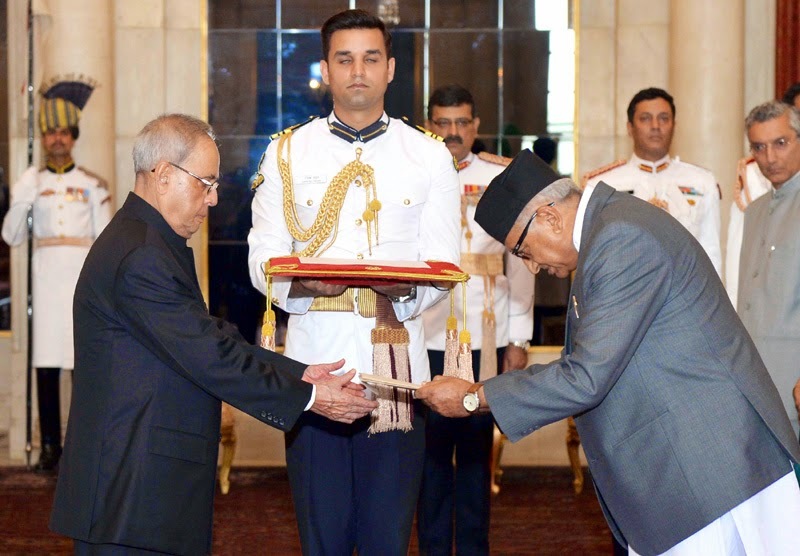 Deep Kumar Upadhyay, Ambassador of Nepal presented credentials to the President of India, Shri Pranab Mukherjee today (April 30, 2015) at Rashtrapati Bhavan. In a meeting following the credentials ceremony, the President said the Ambassador was assuming office at a difficult time in the life of the people of Nepal. The devastating earthquake has uprooted the life of a large number of people with huge casualties and tremendous suffering. As soon as India got to know about the earthquake, it extended its hand of co-operation. He spoke to the President of Nepal and assured that India will do whatever possible to assist its close neighbour with whom it has had close relations for centuries. The President said Indians are with the people of Nepal in this hour of distress. They feel strongly for their brothers and sisters who have been affected by this tragedy. India hopes the situation will soon return to normalcy. Responding to the President’s sentiments, the Nepalese Ambassador said Nepal is struggling to come to terms with the devastation caused by the earthquake. The support and sympathy of the government and people of India is a great source of strength for Nepal. Nepal is grateful for the swift action by the Government of India. The President of India, Shri Pranab Mukherjee has extended his greetings and felicitations to the Government and people of the Republic of the Marshall Islands on the eve of their Constitution Day (May 1, 2015). In his message to His Excellency Mr. Christopher Jorebon Loeak, the President of the Republic of the Marshall Islands, the President has said, “On behalf of the Government, the people of India and on my own behalf, I extend warm greetings and felicitations to you and the Government and people of the Republic of the Marshall Islands on the occasion of your Constitution Day. As the world’s largest democracy, India recognizes the spirit of democracy, freedom and dignity of individuals enshrined in your Constitution. We also share your county’s aspirations for peace and prosperity and relations based on mutual understanding. Excellency, we have recently had the pleasure to welcome the first Ambassador of the Republic of the Marshall Islands. We look forward to working with you and your Government to further strengthen our bilateral relations based on mutual trust and friendship. Please accept, Excellency, my best wishes for your good health and personal well-being and for the progress and prosperity of the friendly people of the Marshall Islands”. The Prime Minister, Shri Narendra Modi has spoken to the Prime Minister of Israel, Mr. Benjamin Netanyahu, today. "I spoke to PM Netanyahu, who had called to extend condolences on the loss of lives due to the Earthquake. My gratitude to PM Netanyahu for his kind words on India's relief and rescue efforts in Nepal including help extended to Israeli nationals", The Prime Minister said. The Prime Minister, Shri Narendra Modi has congratulated noted Islamic scholar and peace activist Maulana Wahiduddin Khan, on being conferred the Sayyidina Imam Al Hassan Ibn Ali Peace Award at a function in Abu Dhabi. "Congratulations to Maulana Wahiduddin Khan, on being conferred the Sayyidina Imam Al Hassan Ibn Ali Peace Award at a function in Abu Dhabi. Maulana Wahiduddin Khan's knowledge and efforts towards peace make him one of the most respected scholars, admired all over", the Prime Minister said. The Prime Minister, Shri Narendra Modi, today spoke to the Prime Minister of Pakistan, Shri Nawaz Sharif, who had called to express condolences at the loss of lives in various parts of India due to the recent earthquake. Prime Minister Sharif appreciated India's efforts in the rescue operations in Nepal. Prime Minister Modi suggested that SAARC countries should conduct regular joint exercises on disaster relief and rescue. Prime Minister Sharif appreciated this idea and told Prime Minister Modi that this initiative should be taken up. The two leaders also discussed unseasonal rain and its adverse impact on crops. There are thirty one countries including India in the world which generate electricity from nuclear source. According to the data published in 2014, by Power Reactor Information System (PRIS) of International Atomic Energy Agency (IAEA), India ranked at 13th position in terms of generation. However, it stood at 7th position in terms of number of reactors in operation country-wise globally. The current installed nuclear power capacity is 5780 MW, which is expected to increase to 10080 MW on progressive completion of projects under commissioning/ construction by 2019. The Government has accorded sanction for two more projects with a total capacity of 3400 MW. More nuclear power projects based both on indigenous technologies and with international cooperation are planned in future. This information was given by MoS in the Prime Minister’s Office and Minister of State in the Ministry of Personnel, PG & Pensions, Dr Jitendra Singh in written reply to an unstarred question in the Rajya Sabha today. an advanced stage of commissioning at Kalpakkam, Tamil Nadu. Financial sanction has been accorded for two indigenous reactors i.e. GHAVP 1&2 (2X700 MW) at Gorakhpur, Haryana and these are being readied for launch in 2015-16. These are scheduled for completion in 2021. Two more indigenous 700 MW reactors are also expected to be completed by 2024. Pre-project activities are in progress at various stages at these sites, where the projects will be taken up progressively, in phases of twin units at a site. The Department of Atomic Energy has set for itself an ambitious target of reaching an installed generation capacity of 63000 MWe by the year 2031-32. The installed nuclear generation capacity by 2031-32 would depend on actual start of projects and their completion, which in turn would be contingent to completion of pre-project activities like land acquisition and obtaining statutory clearances and conclusion of techno-commercial discussion in respect of reactors to be set up with foreign co-operation.